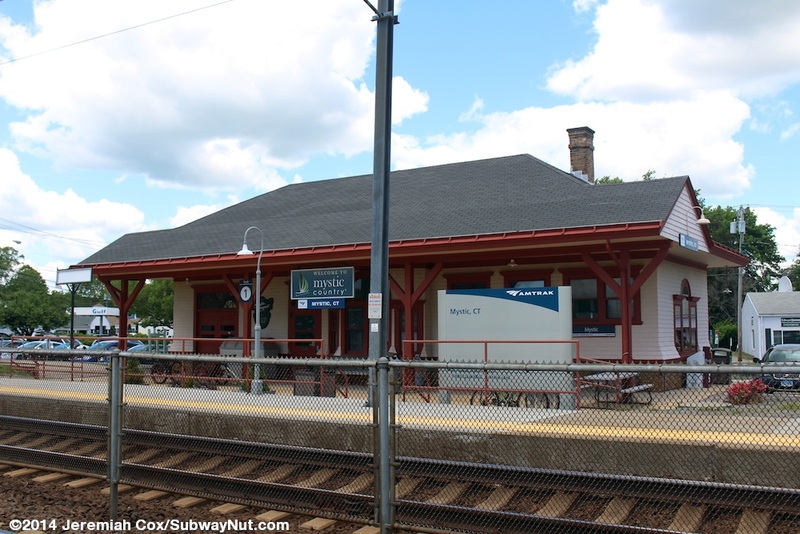 Mystic is the Amtrak station (one of just three on the corridor only served by Amtrak) on the northern-half of the Northeast Corridor with the lowest ridership and least service. 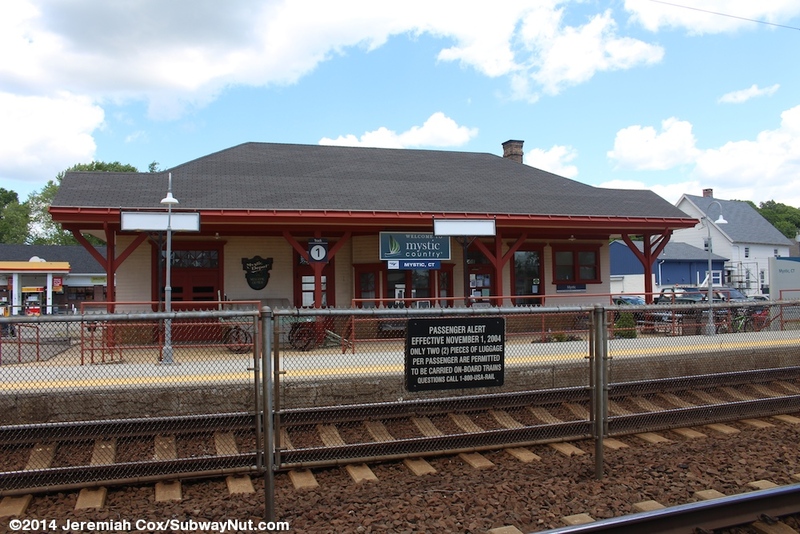 Service to Mystic is abysmal with just three northbound weekday Northeast Regional Trains (including the Night Owl) and four southbound weekday Northeast Regional Trains (including the Night owl) stopping at this Connecticut tourist town. Weekend service is a bit better (I stopped here for a three hour layover going northbound on a Saturday afternoon) with five trains stopping in each direction. The stop has receives continuous train service. 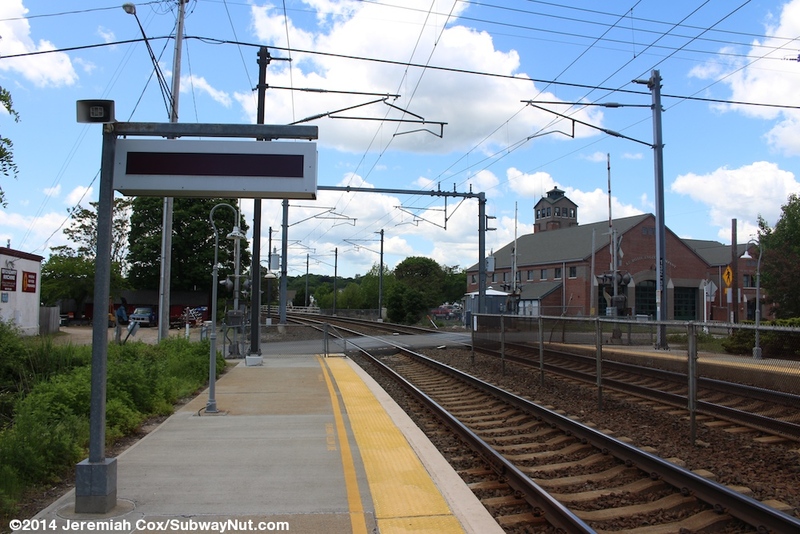 Electrification for Acela Express was completed in 2000 but the grade-crossing at the station for no-Outlet Broadway Avenue extension wasn't removed. This minor street leads down a short point into Long Island Sound leading to boat yards and a few houses. The station has a historic 1905 single story Georgian Revival Station house. The base of the building is brick with singled walls that hold up a high gabled roof that still has a chimney. 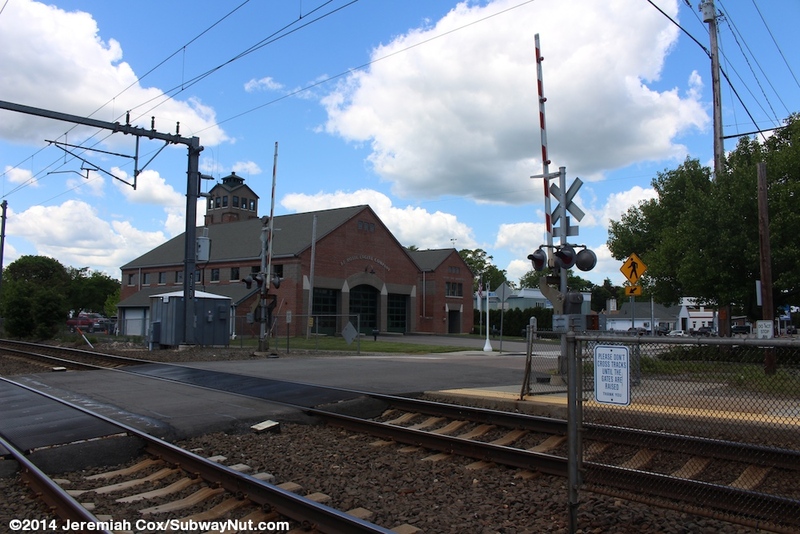 The station was a combined passenger freight depot with a waiting room for passengers on the east side and a roll-up door for freight on the west side. 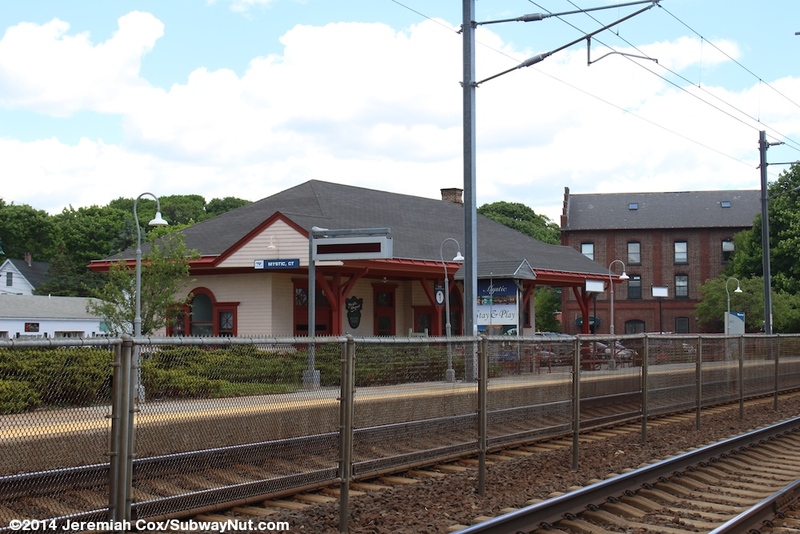 The depot was in disrepair in the 1970s and was generally closed. 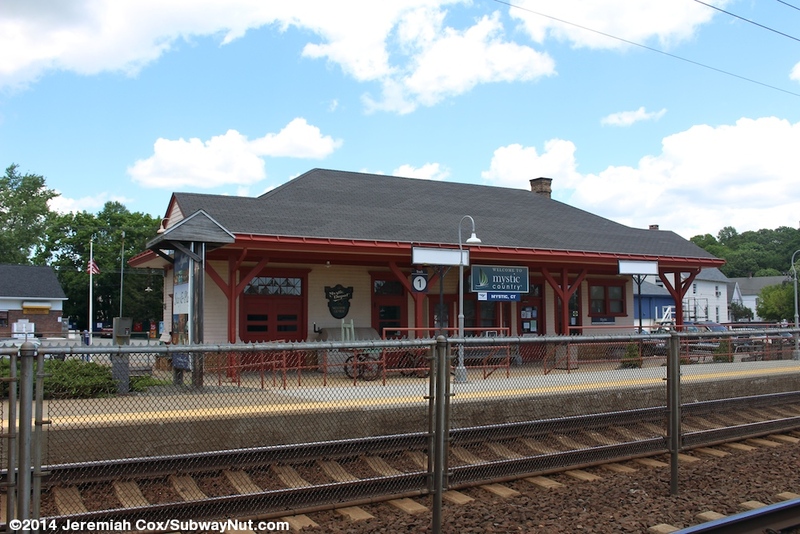 From 1976 to 1978 the depot was repaired and renovated. 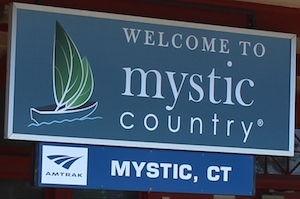 Today it houses the Mystic Welcome Center at Mystic Depot operated by the Chamber of Commerce. The welcome center and depot hours (according to Amtrak.com) are extremely confusing Amtrak claims that the station is closed Monday and Tuesdays, open 10:00am to Noon Wednesdays and Thursdays 10:00am to 2:00pm on Fridays and 10:00am to 4:00pm on weekends. It also claims that a Quik-Trak machine is available 10:00am to 4:00pm daily but the Quik-Trak machine is located inside the welcome center and would have to be open to have the machine open. Inside are mostly walls plastered with tourism brochures but also a few benches. The exterior is painted pink with red trim, and leads to a small parking lot. 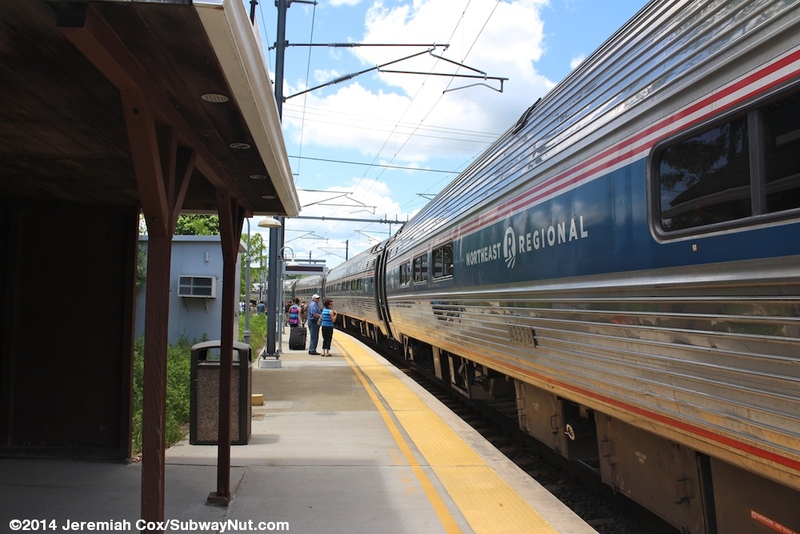 Some spaces are marked Amtrak Customers only. 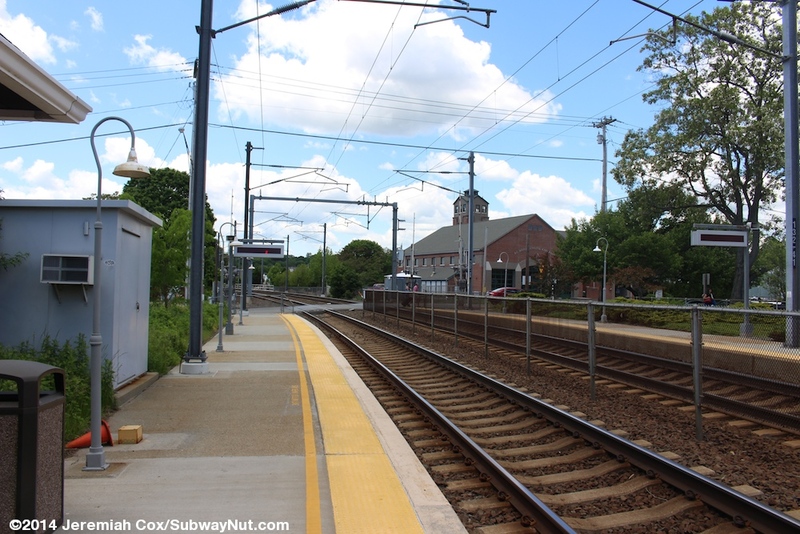 The station has two low-level platforms that begin at the grade crossing of the Broadway Avenue Extension that is the only way to get between the two platforms. 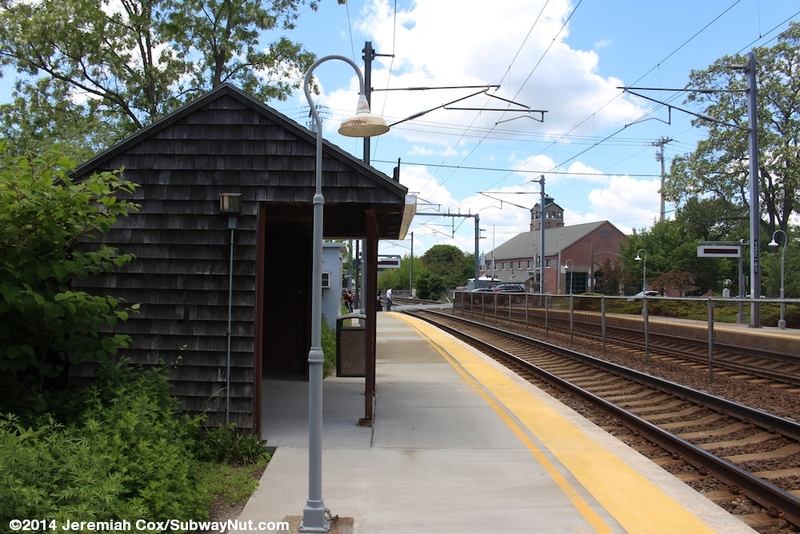 This makes Mystic and New London the only two stops left on the Northeast Corridor where passengers get between platforms via level crossings. 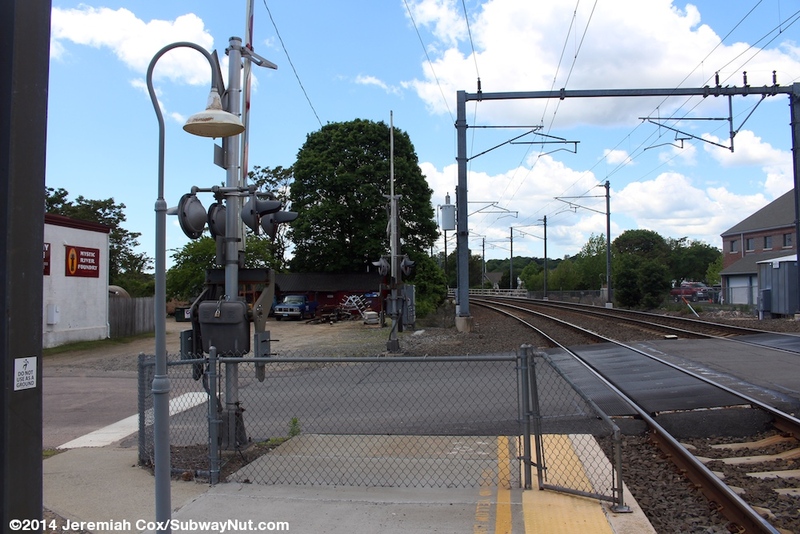 The platforms end at the street but at some time later, for safety fencing was added at the very end of the platforms requiring passengers to go around down a narrow (possibly not ADA compliant) walkway around the fencing ending up behind the four-quadrant grade-crossing gates (complete with loop technology sensors that can notify a control center if a car is stuck). There is also a fence between the two tracks. 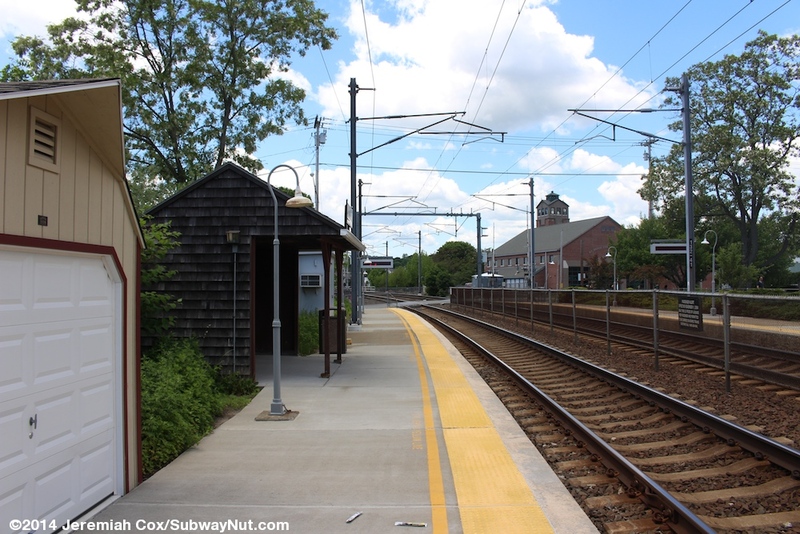 This narrow entrance is the only access point to the Boston-bound platform (Track 2). It extends for only about four car lengths and ends. 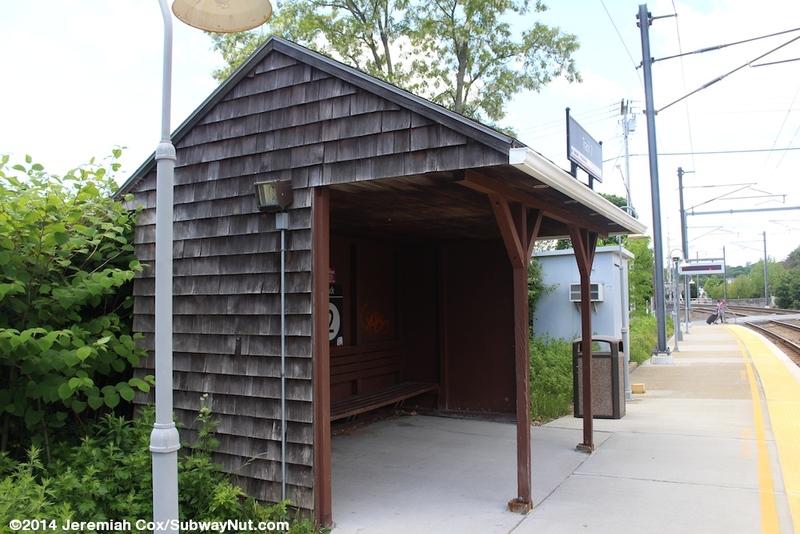 The only amenity for waiting passengers is a small shingled waiting shelter with a built in bench across from the depot. There is also a closed off modular shed with a gabled roof that I assume contains a mobile-lift for wheelchair boarding. 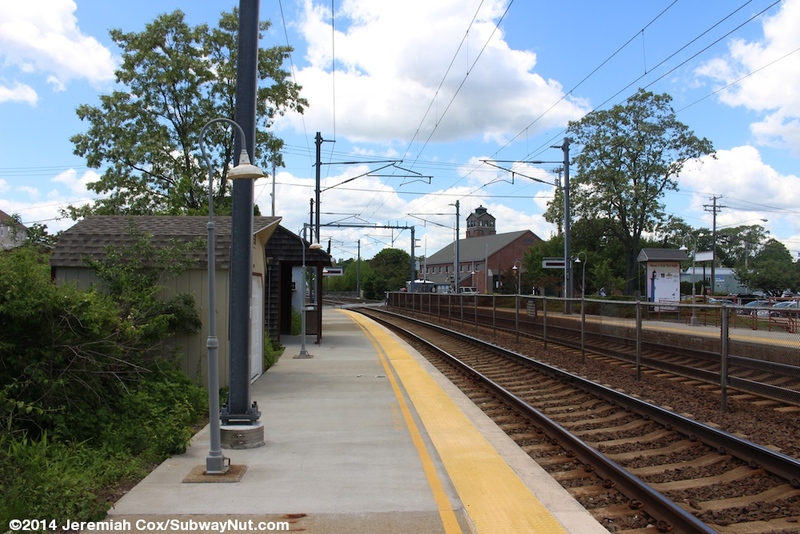 The depot is along the north, New York-bound platform although it is set back from it with what looks like an older platform (with a yellow line) adjacent to the station house. 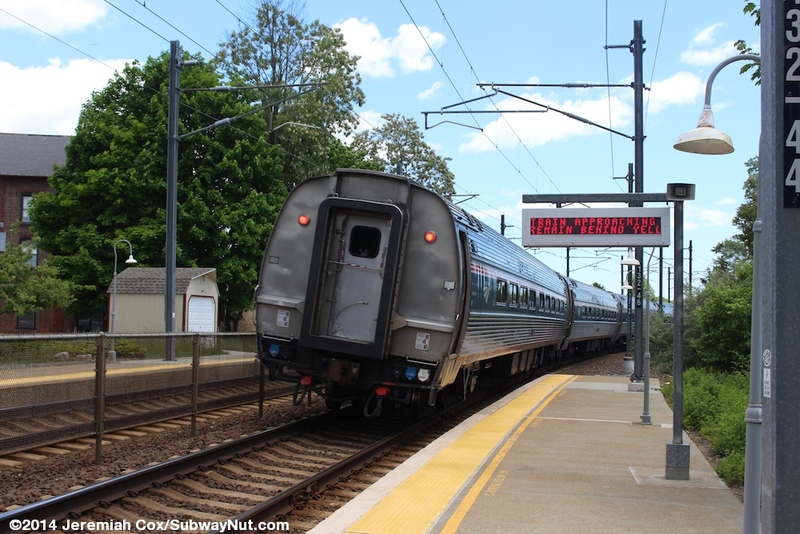 Perhaps the platforms were relocated during the super-elevation of the curve at the station for Acela Express. 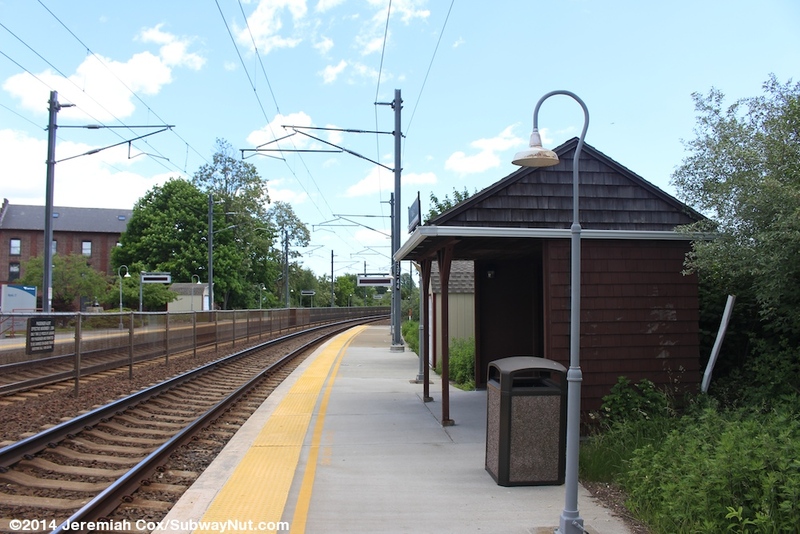 The depot provides access to the platform via a small ramp and a few steps in this area. There is red fencing, and a randomly placed picnic table to wait at. In this area between the depot and Roosevelt Avenue are the station's few Amtrak Customers only parking spaces This platform continues much farther and is nearly double the length of the other platform with nearly ten cars. Just before its eastern end (where there isn't an additional entrance) is a white domed bus shelter with a bench beneath it. It's the only covered waiting area for passengers. 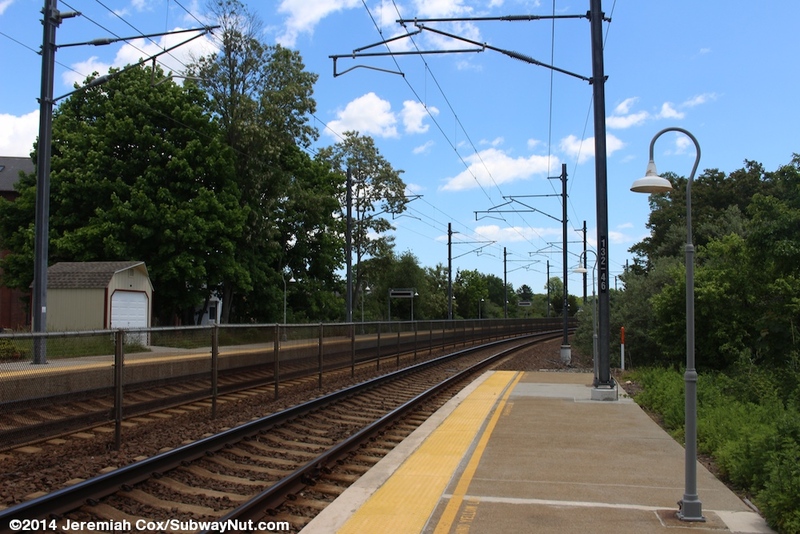 Each platform is also lined with trying to look vintage grey lampposts that loop around, tactile warning strips and train approaching Stand Behind Yellow Line indicators. Signage is minimal. 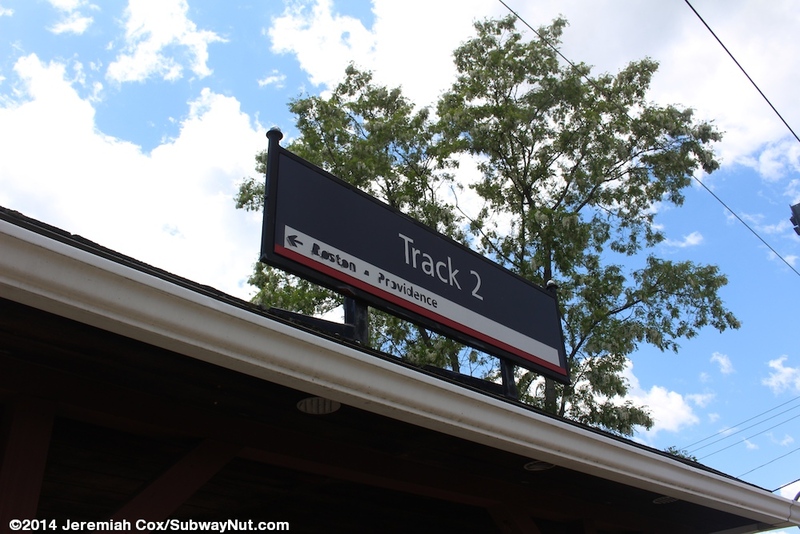 Along the fence of the New York-bound platform are two signs facing the station building in the Blue with white text and arrows beneath for directions. 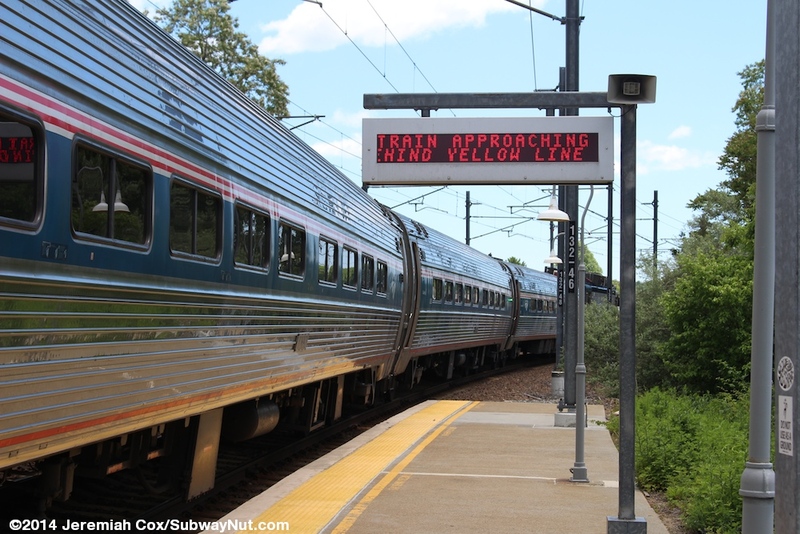 One says Track 1 with New York · Washington in tiny letters and another that says "Please Use Crossing for Track 2 Boston · Providence." 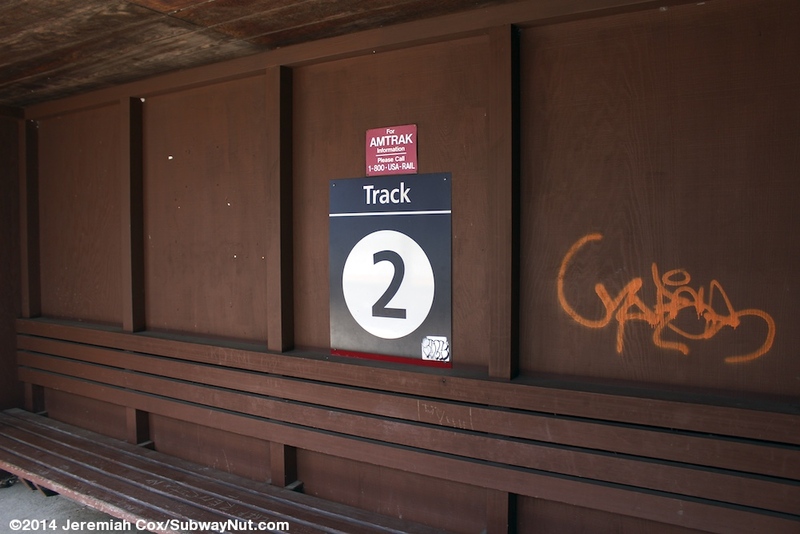 There is also a sign on the shed that just says track 2. 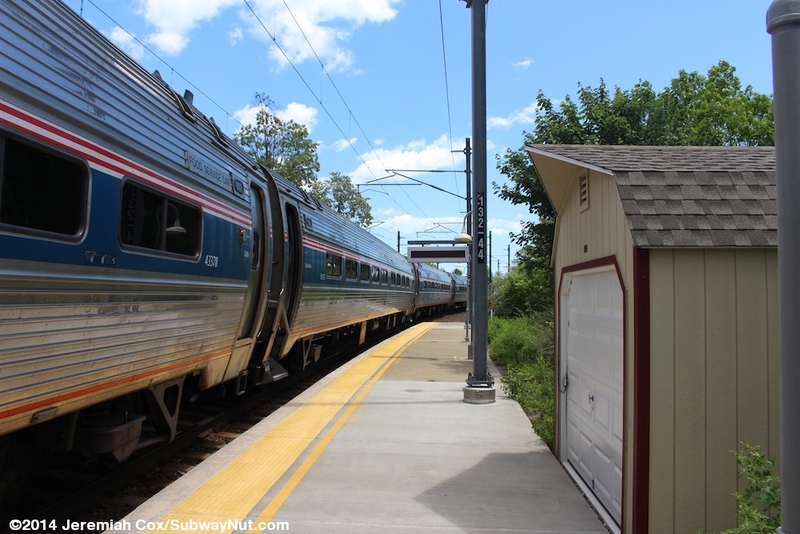 The only signs that say Mystic are some blue next to the modern Amtrak logo signs on the Station House itself.